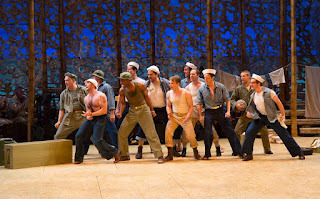 Another TCTB REVIEW ROUNDUP coming your way: Few shows evoke sultry summer temperatures better than SOUTH PACIFIC, currently showing at the Guthrie Theater (through August 28). Our reviewers enjoyed the show and found its major themes, particularly those of racism and the morals we pass down to our children, to be contemporary and powerful. Click the links below to see our thoughts and reasons to see the show, such as: "I can confirm that it definitely is a must-see summer experience;" "In the night, when all goes dark, the stars shone brightly through. South Pacific at the Guthrie Theater is a visually stunning piece;" "La vie est belle, life is beautiful, on the set of South Pacific;" and "There was something more genuine in this production than most musicals. South Pacific became a reality on stage instead of a dream."